What a wet and windy start to the week. I started work at 8am, then went back to the boat to change my soaking clothes at 9am. But before that I had the pleasure of moving two boats; one off the boat cradle on the slipway back into the water and another off its mooring and on to the half submerged cradle at the bottom of the slipway so that it could be pulled out of the water by our ancient JCB. The wind made both jobs very interesting indeed. The first boat belongs to proud new owner and regular site user Simon Birt. It’s a 2003 60′ traditional stern boat built by S M Hudson which appears to be something of a bargain. Simon’s boat, Genevieve, has a traditional layout with a boatman’s cabin at the rear and the engine room in front of that. Most narrowboats have a Morse control gear selector and throttle control. You just push the lever forwards or backwards to select forward or reverse gear. The further you push the lever in either direction, the faster the boat moves. The old traditional boats, and the ones like Simon’s designed along those lines, have separate gear selector and throttle controls. The gear selector is a brass handle which you pull towards you to put the boat into reverse and push away from you to select forward gear. Somewhere in the middle is neutral. Neutral is rarely marked so you have to guess where it is if you don’t know the boat. The engine speed is governed by a wheel. It’s called a speed wheel. You rotate it one way to increase the engine speed and the other to decrease it. These controls aren’t the best in the world if you want to do something quickly because if you want to go from forward to reverse you have to use the speed wheel to reduce the engine speed to idle, pull or push the gear selector rod in the opposite direction, then quickly turn the speed wheel again to increase the engine speed. With a Morse control you simply move the lever from one end to the other, briefly pausing at neutral. A speed wheel takes a bit of getting used to, ideally on windless day and somewhere other than on a cradle seven or eight feet off the ground. The boat was lowered into the water, then I spent a few seconds fumbling with the controls in the driving rain as the stiff breeze pushed me sideways across the marina. With a little rope pulling assistance from JCB driver Jim we managed to tie the boat securely to the side of the slipway before I drove to a mooring at the far end of Meadows marina to collect the second boat. Our two marinas are always a challenge in the wind. Monday was no exception. It’s usually a case of having to be a little heavy handed with the throttle to maintain any effective steering, something which is always a little risky when you’re crabbing across an open stretch of water towards a waiting cradle and a very nervous looking JCB driver. Unusually for me, there were no mishaps so once the boat was safely on the slipway I was free to return to my boat for a much needed change of clothing and to put on my bomb proof waterproofs ready for a very wet morning waddling around the site doing something other than grass cutting. We’ve reached the time of year when we can focus on proactive rather than reactive tasks. I’ve probably cut the grass for the last time this year and the willow’s rapid growth has ceased for another season. It’s time to think about removing this season’s squirrel damaged oak and, sadly, half a dozen irreplaceable hornbeam which are damaged beyond recovery. Our larger wood needs thinning out. There are far too many oak and ash growing too close to each other so I’ll probably need to take 150 – 200 of the weaker trees out this winter. I look forward to the winter woodland projects but I’ll be quite sad while I work. When I began working at the marina five years ago, the woodland area close to our mooring was very much neglected. There were a few little used and overgrown paths along the wood’s edge closest to Meadows marina and very little else. I’ve had the freedom to manage the woods as I see fit. I’ve created paths, removed restrictive fencing, built bridges over ditches, removed stakes and protectors from thousands of trees, removed weaker trees to give the stronger ones more space to grow and planted over 1,000 shrubs to provide ground cover for birds and small mammals. This coming winter will be my last. Next spring Sally and I will set sail to explore the waterways network. Maintaining and developing the woodland isn’t considered a priority. I do it because I love woodland areas and think that our two woods offer an interesting addition to the many acres of easily accessible meadow walks available on site. I hope that my replacement will hold a similar view. Ex Hire Boats – Do They Make Suitable Live Aboard Homes? Have you ever considered buying a hire boat after it’s finished transporting happy holiday cruisers on short breaks? Hire boats are often snapped up by new live aboard boat owners, but are they really a good buy? I’m not sure that they are. A hire boat is designed to accommodate the maximum number of people for relatively short periods. Those people spend much of the day cruising and very little time sitting inside leading a “normal” life. Long cruising days are often followed by long evenings in the pub before a few hours in bed before beginning the cycle again. Because of the crews holiday needs, the boat is all about bedrooms and bathrooms. A sixty feet long boat is a common length for a live aboard boat. A sixty feet long hire boat will sleep six or more. The one below will sleep nine. The plan is of Burdock, the longest in the Calcutt hire fleet. The space labelled 2 & 3 is the seating in the saloon area which can be converted into a double bed. The two spaces labelled number 12 (one on the port and one on the starboard side) are bunk beds. Number twenty three is a double bed with a single bed above it. Up to nine people can sleep on this boat, and they do on a regular basis. I’m always amazed by the number of people that can shoehorn themselves into the boat, and the amount of stuff they bring with them. We had two families take the boat out earlier in the year, four adults and five children. After and seemingly endless stack of bags, boxes and suitcases disappeared onto the boat, two of the adults drove to Tesco in Southam to stock up with food and drink for the trip. They returned after spending £400, not all of it on drink. The wharf staff then helped them load twenty food filled plastic bags into the little remaining space. In addition to the nine berths are a toilet and shower room and another toilet. Each toilet deposits waste into a coffin sized holding tank underneath. The heating on many hire boats and on half of our own fleet is gas. I don’t know if any hire boats have solid fuel stoves. Most don’t because of the safety risks and because of the space they take up. Outside the boat, the bow is open to the elements and will seat six people comfortably. The rear, as with the majority of hire boats, is a cruiser stern which means that there is a large rear deck where the steerer and three or four other holiday hirers can stand in comfort while they cruise. The electrics on board are pretty basic. There are two 110ah batteries in the domestic bank and an additional 110ah for starting the engine. There is a 1,000w inverter on board for running low power mains appliances. Compare the above specification to my own boat which is designed and equipped to accommodate just two people in comfort for long term off grid cruising. At sixty two feet, my boat is marginally longer than the hire boat above but because it has a traditional rather than a cruiser stern I probably have an additional six feet internal cabin space. The downside is that I don’t have as much space at the rear of the boat for people to stand and talk to the helmsman during a cruise. Having said that, on discovery days I have two guests at the back of the boat with me. One or the other of them is steering while the other guest and I try to stay out of the way. When I’m cruising on my own, I have a four feet long tiller for steering. When I have guests I switch to a two feet long tiller to free up vital space. On the hire boat, the front well deck is open to allow hirers to sit in comfort while they watch the world go by. On my boat a triangular cratch board and cover has been fitted to convert this space into a very useful lobby which we use to store stuff we don’t want in the boat like the hose reel, bags of coal, the ash bucket, outdoor shoes, a mop and bucket, a pair of garden shears for taming otherwise ideal moorings and a towel for the dogs. The covered space allows us to dry them off in wet weather before they come into the boat. The covered area also helps retain the heat in the cabin when we open the front doors. Because we don’t have the logistical challenge of sleeping six or more people every night, vital space is available to make our lives more comfortable. For a start we have room for a solid fuel stove. I’m an evangelist for stoves on live aboard boats. If you don’t have one, you’re asking for trouble. They may well take up vital space, require much more effort than a mechanical heating system in terms of keeping them topped up with fuel and cleaning them, but they are reliable. My Torgem stove was installed when the boat was built in 1977. It’s still going strong. The flue pipe has been replaced but apart from that it’s always been there to provide a reliable heat source when it’s needed. In a perfect world I would replace my stove with a more efficient Morso Squirrel, but the Squirrel is slightly larger than the Torgem so I would have to extend the hearth another three inches into the centre of the boat and sit three inches closer to a stove which is sometimes to hot as it is now. I’ll make do with the Torgem for now. Mechanical central heating systems will break down at some stage, usually when you need them most. With a solid fuel stove in place you’ve always got another string to your bow. So we have room for a solid fuel stove and room for some comfortable fitted seating where we can relax on a cold winter’s evening and watch the fire’s flickering flames. Under the seating is some very useful storage space, something which there is very little of on a hire boat. The hire boat above has very little storage space because most of the space inside the boat is taken up by beds, an extra bathroom an open plan front deck and a large open back deck. On my boat there’s more storage space than I can shake a stick at as you can see in this video. The plentiful storage space means that we can keep our small living space very tidy indeed. My boat was deigned to sleep five. It still could, but one of them would need to be a child. The original owner and his wife had three small children. The length of one of the bunks, a space I now use as my office desk, reflects that. I have disposed of the mattress which covered the small bed base so I now have a dedicated and very comfortable desk. Behind where I sit at my laptop are two full size bunks. If we ever make any friends, and they are daft enough to want to stay the night, they can sleep on the bunks in comfort. The main sleeping area is the fixed double bed in the bedroom which is just in front of the engine room. I mentioned that the heating on many hire boats is gas. Gas central heating is very expensive to run and produces a wet heat which aids condensation. I stayed on one of Calcutt Boats’ hire boats for ten days in November 2011 when my own boat was taken away to have the new steel cabin fitted. The majority of our boats with gas heating have Alde boilers but the smaller boats have Riviera heaters. Over the ten days on board I used two full 19kg propane cylinders at a cost of £40 each. The £8 a day average is nearly twice the cost to run my solid fuel stove. I believe that the new Alde compact boiler is more economical to run but I can’t find any average gas consumption figures. However the quoted 405g/h seems quite high. Hire boat electrics are pretty basic. The boat I’ve used for this comparison has two fairly low capacity batteries in the domestic bank. The boat has a total of 220ah to provide power to the on board electrics and a charger so that the boat can be plugged into the national grid via the shore line to charge the batteries when the boat returns to base and there’s a small inverter to run the television and some low power mains appliances. And that’s it. I have four batteries in my domestic bank which total 540ah. I too have a charger built in to enable me to charge the batteries from the mains and I have an inverter. Mine isn’t that much bigger than the hire boat but it will run a washing machine at a push. I also have a 300w solar panel array with an MPPT controller and I have something which no live aboard boater should be without. I have a battery monitor which enables me to see the capacity remaining in the battery bank at the press of a button. Of course, all of these things can be added to the hire boat after you’ve bought it but they’re an additional expense which you may not have considered and things which may be included if you buy a second hand boat which has been designed for extended cruising. A perceived benefit with ex hire boats is regular servicing. It’s true that hire boat engines are maintained on a regular basis, but they need to be because of the frequent use. At seven months, Calcutt Boats’ season is shorter than some hire companies. Our first boats of the year go out at Easter. The last of the year’s hirers return at the end of October. Some hire boat companies operate all year round. 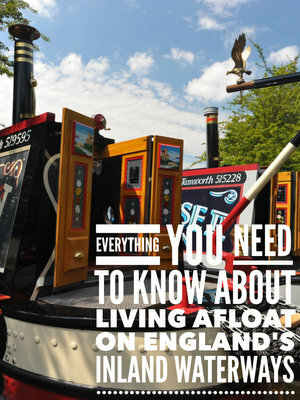 People who hire narrowboats generally don’t hire them so that they can moor in one place for days on end. Most plan quite ambitious routes for their week or fortnight away. Two popular routes from Calcutt Boats are the circular Warwickshire ring and the out and back cruise to Oxford. Both necessitate cruising for seven or eight hours a day to complete roughly 100 miles and 100 locks for the former and 80 locks for the latter. These routes are chosen regularly throughout the season so it’s not unusual for a hire boat to be moving for fifty or sixty or more hours a week for months on end and to suffer the inevitable knocks caused by continuous cruising in all weathers by often novice crews. Most hire boats are worked quite hard. I know two people who have bought ex hire boats to live on. Both were purchased as DIY projects. One was bought four years ago and still isn’t finished. Gary started by considering what he needed to do to make the boat work as a comfortable live aboard. He came to the conclusion that he needed to rip out all the internal fitting and start again. He realised that as a single boat owner he didn’t need two toilets on board. He had to completely dismantle the bathroom before he could remove the back-breakingly heavy waste tank with its decade long accumulation of crusty unmentionables. By the time he had finished removing what he didn’t want in the boat he was left with something very similar to a sailaway. Just in case you haven’t come across them before, a sailaway is a part finished boat, widely available for purchase by DIY enthusiasts who want to fit out their own boat. Here’s an example of a company offering sailaway boats with various options. So Gary purchased a complete boat and then removed all of the internal furniture and bulkheads to take it back to a sailaway state. And then he spent the following four years considering how to fit it out, and then trying to find the time, energy and money needed to finish the project. Three years later, he still hasn’t quite managed it. There you are. A hire boat may at first appear to be a reasonable choice for your new floating home. Now you know the pros and cons. Do you still want to buy one?